Apparently, writing a well-crafted and persuasive email befuddles a lot of writers because they confuse loads of BS with persuasion. Big mistake. Piling on hyperbole only turns a reader off. Keep in mind if you’re writing emails to promote a product it’s far easier to write an email promoting a product with genuine value. The internet is evolving away from hyperbole and spammy promises. Old methods of manipulative copywriting are becoming less effective each day. These old methods are being rapidly replaced by integrity selling. People want to buy from someone they know, like and trust. In other words, it’s about relationships. Relationships, all relationships, are built on trust. So, the last thing you want to do is write an email that compromises the reader’s trust in you. When it comes to emails, simple is better. Emails are at their best when they are used only for communication, so keep it simple…keep it short…keep it focused. And, because an email is best used for quick, sharp communication, don’t pervert it by turning it into a sales pitch. That’s what sales pages are for. Leave the heavy lifting to sales pages and use emails simply to direct your reader there. And Where they can get it… What, Why & Where. WiiFM: What’s in it For Me. When someone opens an email, they’re thinking: What’s in it for me? We all do this either consciously or unconsciously because we only value something as it relates to us or to the people we love. Plus, we’re busy and need to quickly delete anything that isn’t essential. This is why your email should be simple, to the point and present a clear call to action. When creating your email, resist the temptation to shout with all caps and highlight with bolds and colors. A little bit of boldness and color is effective, but there’s a thin line between effective communication and mindlessly splashing graffiti all over the place. Too much color clutters the email and makes it look like spam. That’s a guaranteed way to get your email ignored and deleted. Used sparingly, bold, underline and highlights can bring out key words and phrases and stir interest, but it’s easy to go overboard. A Persuasive Email is a Plain Jane. Branded emails are emails that are dressed up with professional graphics like company logos. They’re not as persuasive as plain text emails and are not read as often. So stick to plain emails with a white background and black text if you want to be persuasive. When possible use bullet points, but no more than 3. Make them the three most powerful points you want to communicate. Ideally, the three biggest reasons the reader needs what you’re offering. Psychologically, bullet points are interpreted as a list. A reader is naturally drawn to lists and wants to mentally check off each point. In most cases, particularly if you want to move a reader to take action, you’ll be more successful with a friendly tone. Imagine that the reader is your best friend and you’re speaking one-on-one over a leisurely cup of coffee about something that will help them. Make it clear what you want to reader to do. Have only one thing you want the reader to do, but include this call to action in several places in the email. Ideally, include a call to action twice in the body of the email and once after the PS. Don’t confuse the reader by trying to get them to do several things, such as “click here to buy my widget” and “click here to visit my blog” and “click here to like me on Facebook.” With so many choices the reader won’t do anything. Include a PS. The PS is the most read part of an email after the Subject Line. People naturally skim down to the PS in hopes of learning the main point of the email, so it’s critical to recap in the PS what’s in it for the reader, what you’re offering and why they need it. Then below the PS put a hyperlink that shows them Where they can get it. Subject Line: I have something personal to share with you. I imagine one of the reasons you want to create a regular online income is so you can enjoy some sort of FREEDOM. If you really want to escape the rat-race…Click Here. The internet has placed your ticket to a new life right under your nose, but you have to be careful. All but a fraction of make-money-online offers are nothing but empty promises. On the other hand, a genuine chance to make money online is based on time-honored business practices like integrity and value. It took me years to find genuine, honest-to-goodness training about online marketing. Now, I want to share it with you. To accept my personal invitation to learn more…Click Here. P.S. If you accept my invitation, I think you’ll soon enjoy personal freedom beyond your imagination. Click Here to learn more. Brilliantly written Gary! You know, I’m so glad the Internet is moving away from all the hype into information that’s bathed in integrity. In the past, when I’ve tried to write a sales type letter, I find it puts me under stress to try and “hype” it up to what I thought was sufficient. You see, I’m not like that. Sure I can get excited about something, but I’d just rather write from excitement and let it be. I really enjoyed reading through this information as it was so clear and to the point. Thank you. Thanks for stopping by. I appreciate your comment and can so relate to your views on hype vs integrity. I think as the internet continues to evolve decent folks will have a tremendous advantage in the market place. Thanks for taking the time to teach and describe how to write a persuasive email. Writing is a foundational life skill and a key skill to online business. Glad to see you mentioned integrity on your post. I use Wealthy Affiliate too and think they have solid platform for people want to learn online business. Thanks for stopping by. Yes, as the internet continues to evolve, integrity will become increasingly important to marketing success. Of course, it always has been, but in the early years of the internet scammers got by without it. That’s changing. Essentially, the most valuable thing on the internet is trust. Hello Gary. You provided great points in your article such as short, clear and friendly approach in emails. Sometimes we forgot that we communicate with real people. We try hard to get attention and forget that it can be annoying. It can cost for us. If we would be to pushy, making to much fuss and we would talk about our needs, our subscribers can disappear really fast. It is easy, just with one push on unsubscribe button. I think that we need to provide for reader clear information, that he or she supposed to do. Explaining what reader will get from email, is a must, if we want to keep our subscribers keep content. Removing redundant words, which do not have importance and they are just a waste in our emails, can save for our visitors time and patience. I learned from your article some details, such as transparency and simplicity. Thank you, all the best, happy writing, Nemira. Thanks for stopping by and adding to the conversation. You make some excellent points. Thanks for stopping by. I’m glad you found my post useful. You make some excellent points in this article. In my last job we used to have what I can only describe as an “email culture”. The office was open plan so if you stood up you’d be able to see most of your colleagues. However, rather than stopping by your desk if they wanted something they’d send you an email! Many of these emails were long and convoluted – clearly wasn’t the best use of time for the company. It did however fill inboxes! I digress somewhat, but my point is that because emails have been poorly utilised over the years we tend to delete more than we read. Perhaps if more people took heed on what they are sending, how they are sending it and to whom they are sending the information we may press delete less often. As you say in your article, simplicity is key. Thanks for stopping by. And thanks for telling us about your last job. I can’t imagine working in such an environment. I have to wonder why your colleagues didn’t just walk over to the person they needed to chat with? The best communication is always fact to face. It’s a lot more enjoyable too. Yes, simplicity is always best, but unfortunately many people think complexity is somehow better. Really interesting article Gary, I like how you went in depth personally and put some systematic approaches that work towards promoting products, this is really useful and informative. E-mails can be the worst especially if you forgot to mention something or made spelling mistakes to someone important – you’ve really got to make an impact as suppose a physical letter. Overall though good work, keep it up. Thanks for stopping by. I appreciate you encouragement. Hi Gary! Thanks for this information, I think in this day and age this writing skill is an extremely important one to have. It’s also good to move away from the ‘scam’ vibe that has moved in on some much internet marketing. I do have a question though- why chose that particular wording for the subject line? Thanks. I agree, emails filled with hype are getting read less and less. That’s a good sign. I like to think it means the good guys are winning. I certainly hope so. You asked about why I chose that particular subject line. If you can make it personal the email will get opened more often, but that can be a rather thin line. I chose to use the subject line “I have something personal to share with you,” because at the end of the email I offer the reader a personal invitation. In theory this email should be expected to perform well, but ultimately we won’t know until we test it. What an awesome article! I’ve been trying to learn how to blog more effectively and everything you said about emailing falls right in line with what I’ve learned. People don’t want to be sold something… people want their problems solved! Thanks for taking the time to explain how to send a proper “sales” email. Very informative! You summed it up beautifully. Thanks for stopping by. This is really great advice Gary, and I’m definitely bookmarking this site for future reference. There is no such thing as too much good advice on writing. Not for me, anyway! Thank you for taking ‘a closer look’ at your email example. That was really helpful to me and I’m leaving here with a new perspective on writing persuasive emails. Selling the click seems much easier now! Thanks for stopping by. I’m pleased you found my post helpful. Yes, selling the click is so much easier. Your post is very good in hielping point out what a good persuasive email should bw all about. People nowadays are inundated with email, so they don’t read them like they used to. The sale doesn’t happen in the email, it’s not the place to offer details. The email is to create urgency, and to give the reader a call to action. It should be plain, simple and to the point. This is exactly what your post is all about. A job well done! Thanks for stopping by. I’m pleased you enjoyed my site and I really appreciate your feedback. I’m always available to help. I’m learning so much and just loving your articles. This is a clear way to convey the most effective method in marketing. Many of the emails I get are deleted because they look to spammy. I would much rather read the plain Jane to the point version you’ve shown us a wonderful example of. 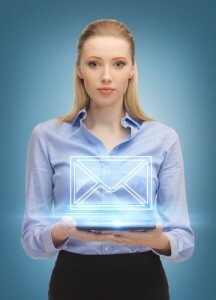 How often do you think emails should be sent out to prospects on a marketing list? Thanks again for this wonderful illustration of an effective email. Thanks for stopping by. I appreciate your comment and excellent question. You asked how often emails should be sent to a marketing list. A few things to keep in mind when mailing to a list is: 1.) You’re communicating one-on-one. 2.) Create value for the members of your list. 3.) Honor the list member’s trust in you. With that in mind. Here’s the sequences I recommend. Day 1: They get an instant email thanking them and welcoming them to your list. Day 2 through Day 5: They get an educational email offering information or solutions. Day 6: They get a promotional email, where you offer a product. Day 7: They get a reminder about the promotion. Week 1 through Week 3: They get an educational email once or twice a week. Week 4: They get a promotional email. You gave several tips on how to write a e-mail. I was surprised that you said use a plain jane approch. I would have guess that it needed dressed up. But you are right if I get one dressed uo they usually get deleted.And you said they should be short and to the point the what, why and where. I have never sent a e-mail, so all this is new to me, but what you explain sounds like it is right. Thanks for stopping by. Yes, it does seem counter-intuitive that the plane Jane email would out-perform the email with a pretty template, but it does based on a lot of testing by large email organizations. The simple emails load faster too. I agree that being a good business person has a lot to do with being able to connect to other people and having them build a trust relationship with you. I am working on establishing my trust right now on my site and its quite fun talking to all these random people from around the world. Thanks for stopping by. I agree it is fun to chat with people from all over the world. I’m 58 and grew up in a small southern town. As a child and young man, I never dreamed the world would one day be so integrated. My hope is that we all learn to see that our similarities are far greater than our differences. A very interesting take on a much loved subject. I certainly don’t read an email if I know it is going to end up trying to sell me something. I like concise information that I can read quickly and get to the point succinctly. Short, sweet and easy to read. Thanks for stopping by and taking the time to comment. I agree, unless I trust the sender, I won’t read an email that is trying to sell me something, in other words, trying to take my money. Writing is a passion I have had. Thanks for some great information, as well as a go to place for all kinds of writing. The internet is such a good source of great information! Learning how to communicate is so important for us all. Thanks for stopping by. I appreciate your comment and kind words. Thank you very much for your tips Gary! I liked them a lot! That WWW-rule is easy to remember. What, Why, Where! Sounds effective! These tips are practical. I think that sometimes I have forgotten to make call to action not clear enough in my emails. I need to improve that. As you said, I have also heard that PS is the powerful way to get the message through. Thanks for stopping by and commenting. I’m so glad you found my article helpful. Iâ€™m so glad I found your post, Iâ€™m going to share this with my team. I head the business development department in a company here in the USA and Iâ€™m currently coaching my team on how to write more persuasive emails can be challenging but it is a crucial aspect of our sales and marketing process. I completely agree that a call to action is totally necessary. Thanks for sharing. Thanks for commenting. I’m glad my article was helpful. After reading, I went through my email and coincidently the emails I open are the plainest ones with listed information. This is a really good guide and one I will surely use in the future. I added it to my favourites. The Where-Why-What format is really simple an easy to use, thanks for sharing this precious info! Thanks for stopping by. I’m pleased you found value in my post. I’m in affiliate marketing and I haven’t really began utilizing emails yet as a form of contact and communication. I’ve recently set up summon so now I have a pop up for subscribers. Initially I didn’t like the pop up but apparently readers do so I’ll keep it. One of the things you said in your post is to keep it simple and keep it short. As a consumer and email receiver I find the example too long. I would open it look at the length and then delete it without reading it. Would it be okay to make it even shorter? Good to see you again. Yes, by all means, edit the examples as you like. I know that a good email is always enticing. You have pointed out that we need to keep it simple. I don’t like long emails. They bother me. I love email that consists of salutation, the message, and a call to action. That’s it. If you want me to read more about something, do not put it on the email. Just give me the link. If I’m interested, I will open the link. But long emails certainly need an X button to close them. Thanks for stopping by. I agree short and simple emails are the best with a link to more information if needed. The challenge is to make the short email interesting and focused. It is usually more difficult to write a concise and focused email than a long rambling one. Ultimately, when we open an email, we want to know if it can help us or entertain us and we will make that decision in a micro-millisecond. Good post! Sometimes people don’t put enough effort into compiling good professional communicative emails. We tend to just slap it together and hope something good becomes of it. What most people don’t realise is that an email is an official document signed by you in the former of your email address. And once it’s out there in cyberspace it’s a document that can be used against you for any malicious purpose. So one has to be very careful and wary when compiling and sending emails into cyberspace. I agree. Everything on the internet seems to be at the speed of light. In the past, writing a letter might take hours or even days, but now with the internet, we just knock out an email and send it on its way. When it comes to writing persuasively, tone and sincerity can be as powerful as the words. As the internet evolves, people are learning to ignore sales pitches in every form so building a relationship of trust is essential. Excellent points on writing a persuasive email. I’m bookmarking your site as I have a lot of interest in making income by writing. Skimming through your site I see you’ve reviewed a number of resources. Right now I’m writing at least a couple of posts weekly for my own site and my plan is to begin offering to write original content or optimize a clients posts for SEO. It’s easy for me to do 1000 plus words in my own niche that I’m intimate with. How easy is it to do that kind of output with random information you have no experience with, and possibly little interest in? It’s so much easier to write about subjects you are familiar with or at least interested in. As you expand your client base, I recommend you focus on a specific niche until you have mastered it before writing in another niche. Writing for your own site is the best because it continues to earn for you over time. When you write for a client you will usually only get paid once. Thanks for you kind words. I’m pleased you found my site useful.